SPECIAL OFFERS: FOR EVERY 3 NIGHTS PAID YOU GET 1 NIGHT FREE, DURING THE SAME STAY. PAY FOR 5 NIGHTS GET 2 NIGHTS FREE, DURING THE SAME STAY. 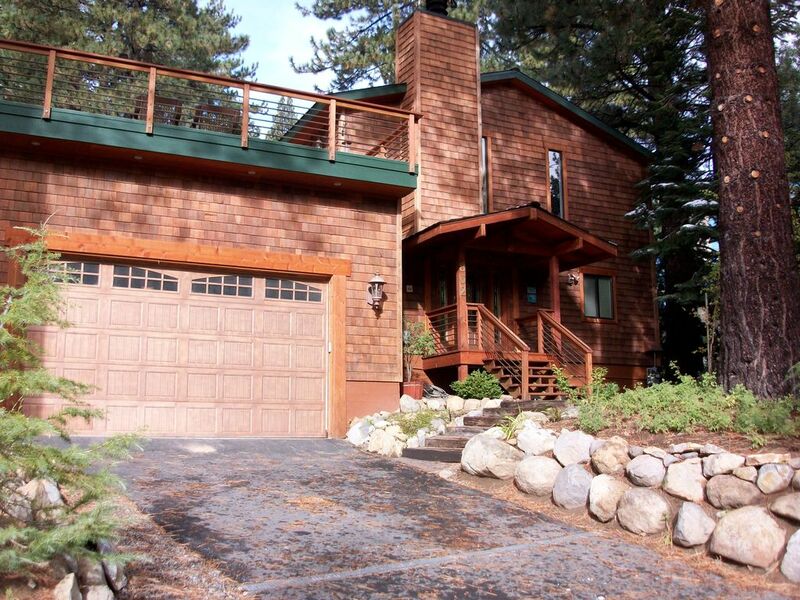 'Knotty Bear Lodge' Our comfortable Lake Tahoe home is family & group oriented, with hardwood floors & carpet. There are two living areas, The first one has a stone fireplace, sofa, love seat, chair, rocker & Flat screen HD T.V . & The other one has a pellet stove, Large sofa, love seat, chair & Flat Screen HD T.V.. There are 3 decks, one with the hot tub, one off the Kitchen & Master Bedroom with a view of the Forest Preserve behind. And at the front of the house a huge deck with a view of the mountains & at sometimes of the year a peek of the lake. We call this our 'outdoor' living room. Our newly remodeled gourmet kitchen is a joy to work in with granite counter tops and lots of space, stainless appliances, including a 5 burner cooktop, double oven, wine cooler, microwave and french door refrigerator. The kitchen is outfitted with just about anything you will ever need during your stay. The lay out of the house is as follows: The Upstairs has a King Master Bedroom with a Gas Fireplace & Granite Bathroom. Also Upstairs is a Double Bedroom & Queen Bedroom sharing a Granite bath. Downstairs there is a Master Bedroom with a king bed and Bath. Also a Double bedroom & a Queen Bedroom sharing a Bath. We have a full laundry, WiFi, plus several large HDTV's. There is a nice hot tub on the lower deck. Our home gives everyone privacy and space. We are 1.2 miles from the lake, approximately 1.5 miles from the Hyatt, Chateau, & Championship Golf Course. 3 miles to diamond peak ski area, 5 miles to Crystal Bay Casinos. Please come to our home to relax, and enjoy the mountains as the setting sun lights the sky. We love Lake Tahoe's North Shore, it is a special area with lots of wild life and on the 'quiet' side of the Lake. Bathroom 1: Upstairs Master Bath: Granite Shower and Granite Counter top. Bathroom 2: Upstairs: Granite Shower and Granite Counter Top. Bathroom 3: Downstairs: Has combo tub/shower and Granite Counter Top. Bathroom 4: Downstairs: Has combo tub/shower and Granite Counter Top. Large Gourmet with granite counters and stainless appliances. Parking for (2) smaller cars or (1) large SUV & 1 smaller car in the garage, and (2) cars on the driveway in winter. The location of the house allows for prompt plowing during snow so you can be off to the slopes early. We provide snow removal of the driveway and front walkway during heavy snowfall. Plenty of on street parking during the summer months. There is a HD flat screen TV in the living room, with a DVD player, a CD player and VCR with lots of VCR tapes. The Family Room has an HD flat screen TV and a VCR with lots of childrens VCR tapes and games. There is a wine refrigerator in the kitchen and the cook top has 5 burners. We have a waffle maker, food processor, blender, electric griddle, electric carving knife, fondue pots, crock pots, pasta pots, toaster, coffee maker, coffee grinder, electric tea pot, popcorn maker, and just about anything else you could want! We have spices & condiments for you to use, and we start you out with paper goods & soap. Outstanding House to spend your vacation in. This house has everything you want in a vacation house. Well equipped, great location. Wonderful home that fit our needs perfectly. Will reserve again! Thank you so much for your review, we are looking forward to having you and your family stay in our home again!! Home was nice, very spacious. Worked great for the 3 families with kids. Wish the hot tub was bigger. The kitchen had a few issues, no sponges, soap had to have been watered down by 75%, dishwasher didn't clean dishes and left a VERY weird black residue in all the cups. The worst part was there was NO water pressure, I mean none. It took 15 minutes to fill a lot of water and washing dishes was horrible. We called Ramon a few times, he finally called back the day before we left, came over to look but couldn't fix. Never realized how much a kitchen sink mattered until it didn't work. I am very sorry you were so unhappy with your stay to give us the lowest rating we have ever had in 18 years of renting our home. 1. The hot tub is the size it is as shown in the listing pictures. 2. We do not supply sponges as they are the single biggest risk of transmitting bacteria like Salmonella in kitchens and baths. 3. We never water down our dish soap, however there is another bottle at the back of the sink cabinet, and another in the cabinet in the laundry where the laundry soap is placed. 4. The water pressure was the result of a broken cartridge in the Grohe faucet. We have no control over a factory defect. 5. I have checked with the renters before you and after your stay and both renters assure me there was no "black residue" from the Bosch dishwasher. I am not sure what the problem was during your stay but perhaps you didn't had it on the proper cycle. These renters also said the water pressure wasn't a problem for them, it just took a bit longer to fill a pot or the sink. The defective faucet has been replaced. 6. When you texted me about the water pressure you did so at 10:42 pm 2 1/2 days into your 4 day stay. The next morning, I contacted my property manager and he came to the house promptly. Again, I am sorry you found so many "issues" with our home. We wish you well in finding the perfect rental the next time you rent. We rent the place so we can enjoy the winter snow but unfortunately there wasn’t any. Nevertheless we are so happy and had the time of our lives in this lovely home. Rooms are spacious. Place is clean and very well kept. I’m gonna think of this place next time we are out there. Special thanks to the owner Joanne for sharing your wonderful home. We are glad you had a good time, despite the lack of snow. I have been doing my snow dance but I must have some of the moves wrong. Now you know Tahoe can be beautiful any time of the year!! Hope to have you back soon. Fabulous place! Comfy, well equipped, and very convenient. Kitchel had everything you could want. Out downstairs master room mattress was a bit firm and slopes but we slept great! Everybody else was comfortable. Dining table great for 9 for Thanksgiving. Lots of stairs at altitude but no problem! Huge deck in the tight weather. Close to amenities but quiet. Hot tub was a hit! Glad you enjoyed the house. As to the mattress, all mattresses have been replaced within the last 2 years. Some people like soft, some firm, we tried to do the middle of the road. Our Home is in quaint Incline Village on Lake Tahoe's North Shore. Conveniently located between Reno & South Shore. There are boundless activities year-round including Shopping, Restaurants, Casino's, Bowling, & Movies, as well as a lovely Indoor Recreational Facility with a Pool, Gym, Basketball, & Exercise Classes close by in Incline. During Winter several Resorts offer Cross Country & Downhill Skiing, Ice Skating, Sledding, Snowboarding & Snowmobiling including Diamond Peak, Mt Rose, NorthStar, Squaw Valley, & Heavenly Valley. At the house, sled on the hill behind or build a snowman, soak in the Hot Tub. During Summer, Spring & Fall there is Golf, Miniature Golf, Biking, Hiking, Tennis, Walking, Swimming, Scenic Drives, Boating, Fishing, Rafting, Kayaking, Jet Skiing. A beach pass is included. At the house you can relax on the deck, Bar-B-Q on the gas grill, star gaze from the Hot Tub, curl up by the fire, read a book or watch a movie or cook in our gourmet kitchen. Not a bad way to spend a relaxing day! Golf: The Championship and the Mountain Courses are close by. The Mountain Course is across Mount Rose Highway from us. The Championship course is about a 5 minute drive. Ski: Diamond Peak Ski Area is about a 5 minute drive from the house. Mount Rose Ski Area is about 15 minutes from the house. NorthStar Ski Area is about a 20 minute drive (depending on weather). Heavenly Valley, Squaw Valley, are about 30 minutes (depending on weather). For every 3 nights paid you get 1 night free, during the same rental period. Weekly rates are calculated pay for 5 nights get the 6th & 7th night free. For longer stays please inquire. Rental agreement is required as is Booking/Security deposit of $750 to secure requested time. In the event the hot tub is left dirty and requires a dump and scrub the $200 fee will be deducted from the security deposit. If the garbage and or recycle cans are put our with lids not latched the fine from Waste Management can be as high as $499 and will be deducted from the security deposit.